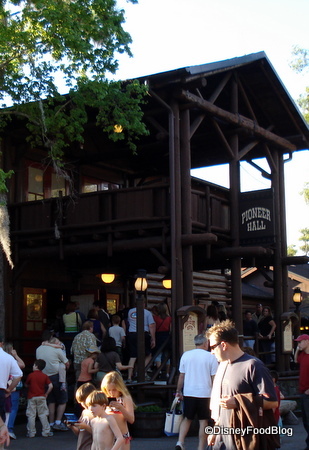 Update: Hoop-Dee-Doo will now remain open in Fall 2012. Update: Bistro de Paris will remain closed through early December. New name for Bistro de Paris will be “Monsieur Paul” — a fitting tribute to Chef Paul Bocuse! 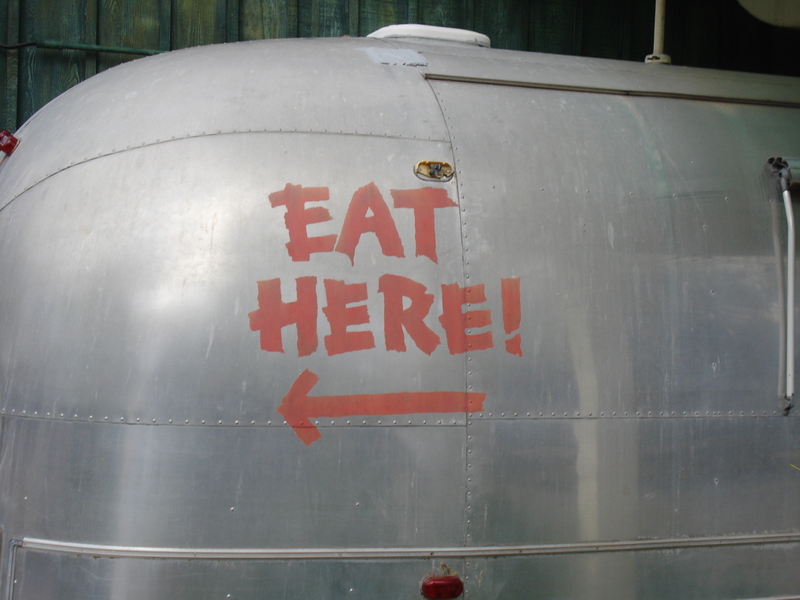 There have been a lot of updates about restaurant closures lately, and I wanted to share the latest information we have so that it’s easier to make (or cancel or change ;-D) your Advance Dining Reservations. 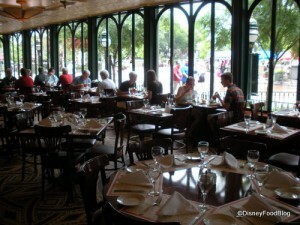 In today’s news, the Signature restaurant Bistro de Paris in Epcot’s France pavilion will be closed for renovations starting July 1, 2012, and lasting until the end of October. According to emails being sent out to guests, Advance Dining Reservations are being moved to Chefs de France. This closing is possibly due to the Epcot France bakery expansion about which we’ve previously reported. The French bakery, Boulangerie Patisserie, is slated for many changes, including an updated menu, expanded kitchen, and more. 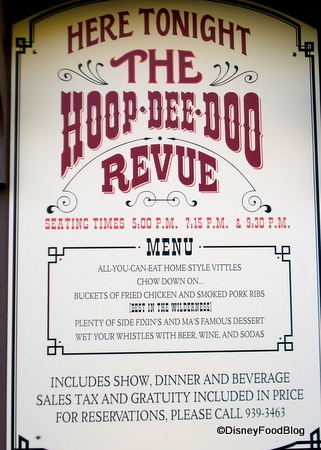 Disney World’s Hoop Dee Doo Musical Revue Dinner Show has undergone some significant changes over the past few weeks. Due to contractual, copyright, and legal issues, some of the show’s songs have been eliminated from the performance — including the well known “Hoop Dee Doo Polka” that started every show! Hope the Strawberry Shortcake song isn’t going anywhere…! See our review of the food here. Have you seen the new version? Let us know your thoughts in the comments below. 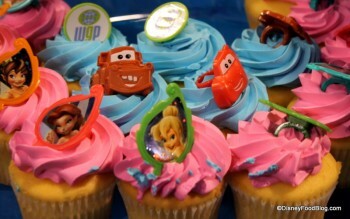 News from D23 Expo, including scoop on the Carthay Circle Restaurant and D23 Expo Reception Eats. Oh, yes! Mickey-shaped pretzels were spotted in the Magic Kingdom! We’ve got more news coming out today, so stay tuned! 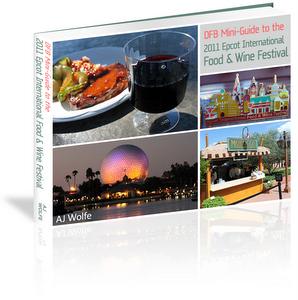 Reminder: The DFB Mini-Guide to the 2011 Epcot Food & Wine Festival e-Book Now Available! Our guide includes over 130 pages of information about this year’s Festival! It’s written as a planning guide for veterans of the festival and those visiting for the first time! One of our favorite bonus items is a daily schedule to help you plan your most delicious adventures! Daveland takes us back in time to the Contemporary’s Top of the World. See more photos here. 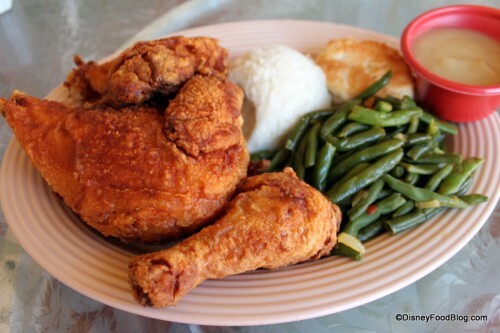 Main Street Gazette reminds us that ordinary WDW food is special too! Root beer floats! Gorillas Don’t Blog show us vintage popcorn boxes! The Disney Blog shows us the changes made in the Hoop-Dee-Doo Revue song due to a copyright issue. 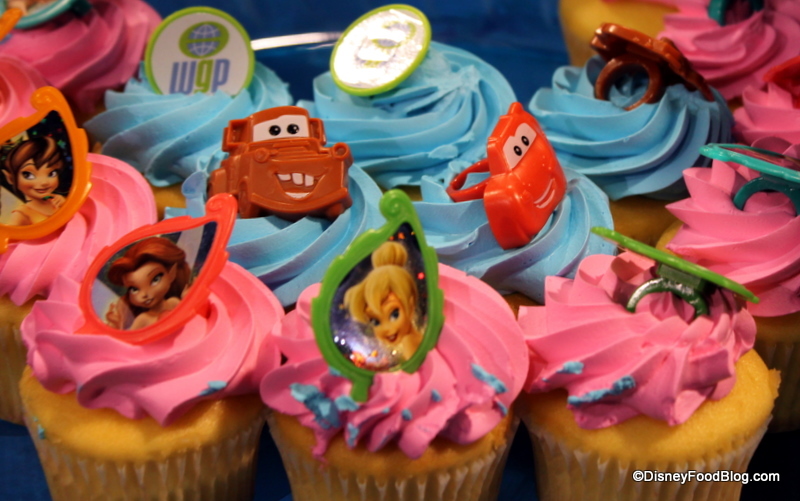 Disney Parks Blog begins a new series highlighting the beautiful cakes made at WDW. Yes, bake me a cake, too! I am SO excited to be finally writing about this topic. Hoop Dee Doo Revue is justified in being one of the prime Disney World dinner shows, and I can see why folks make it a priority stop on so many of their trips. So, tie on yer ‘kerchiefs and grab yer spurs, y’all! We’re goin’ to Pioneer Hall! 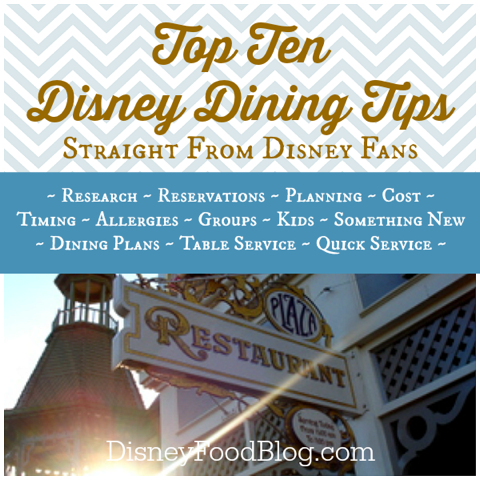 You guys remember when we covered the Top Ten Disney Dining Tips, right? Overwhelmingly, the tip that was mentioned the most by Disney Food Blog readers was making Advanced Dining Reservations for high priority meals at Disney parks and resorts. 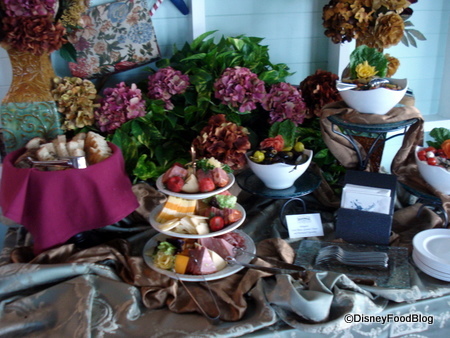 UPDATE: Read about the Opening Date for Be Our Guest Restaurant and Reservations Info! 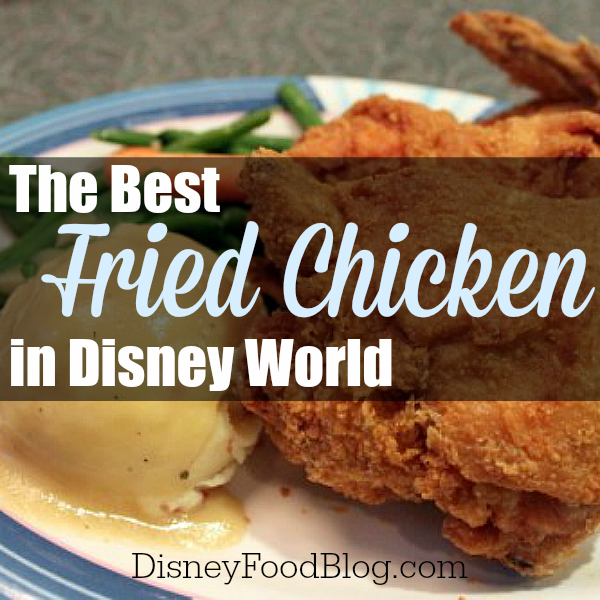 All in all, we nibbled, tasted, sampled, noshed, and all-out devoured our way through some of my favorite Disney restaurants, including Flying Fish Cafe, Hoop Dee Doo Revue, Cape May Cafe, and Kouzzina! I had the chance to meet and chat with some Cast Members charged with not only developing concepts for new Disney restaurants, but also with ensuring that Disney Food and Beverage is running smoothly day-to-day. For some people, a Disney “Dream Come True” trip includes a stay in the castle or special VIP time with Mickey. All of that is nice, but this past weekend was a Dream Come True trip for a Disney- and Food-lover like me! I posted a few of the highlights last week, but wanted to share a few more with you as well — including some tidbits of info I picked up along the way! For those wondering if going to the parks during a traditionally slow season negates the need for ADRs, it doesn’t. The popular restaurants are always popular, and Disney’s “slow seasons” are getting shorter and shorter. Making reservations usually costs nothing, and can save you lots of time during your trip. Here’s a primer on how to make reservations for Disney Restaurants. Of course, if you’re dead set against making advanced reservations, here are a few of our suggested restaurants you can still get into without an ADR. Lots of folks suggested that an important part of planning your Disney dining is doing research about the restaurants and dining options available. I couldn’t agree more. Check out restaurant reviews, learn from other Disney fans how they handled Dining planning for their vacations, read trip reports, and sift through the posts here on the Disney Food Blog. The more you know, the better prepared you’ll be to create a seamless Dining strategy that will be enjoyable for your whole family. One great tip: take stock of the types of eaters you’re bringing with you; make sure you know if you need to plan for fussy eaters, specific eating schedules, food allergies or intolerance, or just plan likes and dislikes, then translate that into your research. We have plenty of dining reviews right here on the Disney Food Blog, of course, but we also have some great reference information on choosing restaurants when you have special diets to consider. Check out our Disney Dining Reference Page or the “food allergies” section below for more. Tables in Wonderland has added to its discount list several new restaurants in Epcot, the Swan and Dolphin Resorts, and Downtown Disney. WDWMagic reports that WDW’s Sunshine Tree Terrace will be closed for refurb from January 17th through February 12th of this year. BizJournals has some more updated info on the Cantina de San Angel refurb in Epcot. 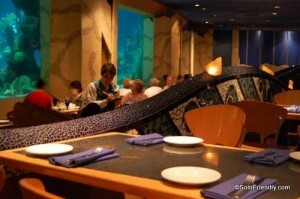 The Disney Blog has news of some Valentine’s Day Dining Options in Disney World. DLP.info reports that Disneyland Paris’ California Grill restaurant will be a buffet from January 10th through February 4th, 2010, due to refurb at the restaurant next door. StitchKingdom has exclusive pics of Disney World’s new 3D Mickey Ears, including two for the foodies representing a Mickey Bar and a Popcorn container. Daveland went to Disney World and got himself some amazing pics. In his trip report photo blogs, you’ll see incredible shots of Victoria and Albert’s (trip report Part I), Liberty Tree Tavern (plus the characters!) (trip report Part II), and Hoop Dee Doo Revue (trip report Part III). WDWforGrownups found a fun photo of a Mickey-shaped hamburger bun from DLRP. The Disney Chick cooked up a couple of dishes for your recipe books: Mango Mousse from the Epcot Food & Wine Festival, and Shrimp and Proscuitto Penne Pasta from the Grand Floridian. Imaginerding has the third book update from Restaurantosaurus in Animal Kingdom’s Dinoland (really fun posts, in case you haven’t made it over there yet…). Meet the World has this historical essay post on Disneyland’s Lunching Pad. Disney History Institute tells a fascinating story about the Christmas packages Walt Disney sent to the hundreds of children on his list and includes a photo of what went into the Christmas boxes in 1945. 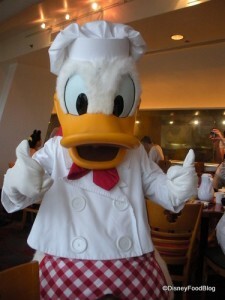 Trust me, it’s about food; and if you’re a Donald Duck fan, you’ll need to read this one. StudiosCentral visits 50’s Prime Time Cafe and comments on location, decor, and why it “fits” at DHS. DisneyGeek has some pics from his D23 Magic and Merriment trip, including some great shots of the WDW Diamond Horseshoe (keep going through the pages…this is only the beginning) and a very detailed set of pics from his tour of the Cinderella Castle Suite. The index page for the photo set is here. (I know the Castle Suite isn’t about food…but it IS very cool, so you’ll have to forgive me for mentioning it…). The Angel Forever has some fantastic food photos over on her blog this week! DISUnplugged has two great stories: one about a family planning to eat their way around Disneyland this year, and another highlighting photos from Friday’s Tables in Wonderland Great Movie Ride dinner (sadly, the latter doesn’t have any food photos, but the descriptions and scene shot photos are awesome). I’m honored to bring you a guest post by one of my favorite travel bloggers, Gray at SoloFriendly.com. Thanks again, Gray, for sharing your insights and tips on dining alone in Disney World! Many travelers, even those who are excited by the prospect of enjoying some alone time at Disney World, get queasy at the thought of having to eat alone. This, despite the fact that Disney has fabulous restaurants and legendary customer service. Don’t be nervous just because you’re a “party of one”! 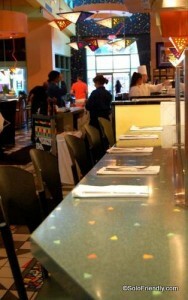 I have eaten alone in many restaurants in Disney World and 99.9% of the time have received the most exemplary service. 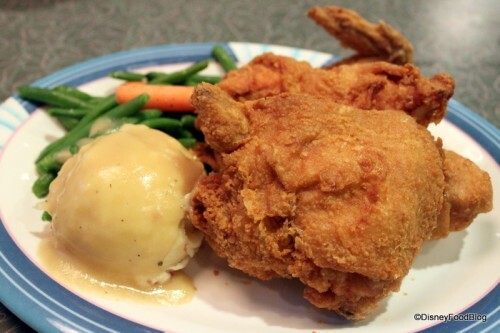 Go ahead and eat at Quick Service restaurants if you’re on a budget, but don’t cheat yourself out of the wonderful table service restaurants if you can afford it. A delicious sit-down meal prepared by one of Disney’s talented chefs will certainly enhance any solo trip to the World. Have your table service meal during a less crowded time. This could mean eating at an off hour. Chefs de France, for instance, is far more enjoyable when there are fewer guests in the dining room. It’s quieter and more peaceful, and the odds of scoring a table by the window (for people-watching) are greatly enhanced. Resort restaurants tend to be less crowded during lunch, when everyone is at the parks. I had a wonderful meal at Sanaa on my last trip, right around noon, and I was only one of maybe three tables of diners in the whole restaurant. Again, you have a greater chance of scoring a good seat this way, but you also feel less conspicuous. Eat at a restaurant with bar or counter seating. If you are a social person, this affords you the opportunity to interact with other diners. One of my favorite meals at Disney World was at Wolfgang Puck Cafe in Downtown Disney, when I sat at the counter in front of the chef’s station and had a lively and friendly chat with the chef while he prepared meals. Bluezoo at the Dolphin resort (a wonderfully grown-up restaurant), the House of Blues in Downtown Disney, Jiko at the Animal Kingdom Lodge, and the Flying Fish Cafe on the Boardwalk. 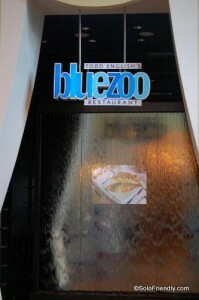 Enjoy a dinner show. You have many options at Disney World for dinnertime entertainment, including the Spirit of Aloha Show at the Polynesian Resort, the Hoop-Dee-Doo Revue at Fort Wilderness, as well as smaller-scale entertainment such as watching a movie at the Sci-Fi Dine-In Theater or belly dancers at the Restaurant Marrakesh. Go for a great view. The Disney Food Blog recently highlighted the best restaurants for watching the Wishes and Illuminations fireworks shows during dinner; those are great choices. As with anything, practice makes perfect. The more you dine out alone, the more comfortable and enjoyable it becomes. From the Editor: Thanks again, Gray! DFB readers, if you’re interested in more info about solo dining in Disney, stay tuned for the next post in the Walt Disney World Moms Panel Mini-Series where the moms chime in on their choices for meals if spending a day blissfully alone at Disney World!